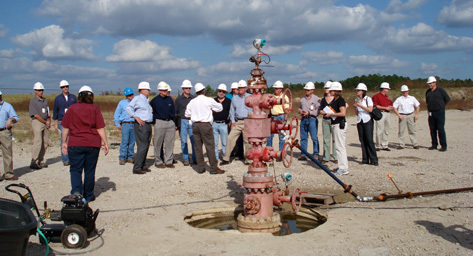 Welcome and thank you for your interest in the Southeast Regional Carbon Sequestration Partnership (SECARB), a regional network of more than 100 stakeholders with a common goal of determining the best approaches for capturing and permanently storing gases that can contribute to global climate change. The Nation’s leading scientists, university researchers, national laboratories, industrial representatives, environmental organizations, and many others have taken a proactive approach at identifying and characterizing the most promising options for technology deployment and geologic CO2 storage for the Southeast. This activity includes detailed analyses of the geology of the region to ensure that multiple “seals” exist above the injection zone to trap the CO2 in deep formations, identifying major sources of CO2 emissions, determining the best technologies that can be deployed at the source in order to capture the CO2, regulatory permitting, and, most importantly, tailored monitoring, verification, and accounting protocols to ensure that the CO2 injected is traceable and to protect underground sources of drinking water and the environment. seams in which CO2 can be injected to enhance coalbed methane recovery. Some have depleted oilfields that have significant volumes of oil that could be produced by injecting CO2 and allowing its natural buoyant properties to drive the oil to an existing well for production that otherwise would have been unrecoverable. We invite you to peruse this website to discover the many opportunities that our research unveils and the projects that our team of experts is leading. 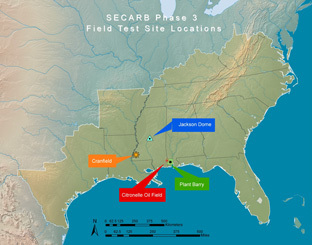 SECARB is one of seven Regional Carbon Sequestration Partnerships (RCSP) established by the U.S. Department of Energy (DOE) in 2003. The seven partnerships form a national network of more than 400 organizations covering 43 states and four Canadian provinces. 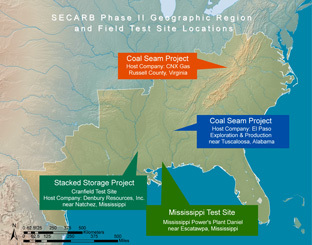 The SECARB program is funded by DOE and cost-sharing partners. Plant Barry’s integrated CCS is a globally significant project in combating climate change. Success at Plant Barry will lead to deeper scientific understanding and wider acceptance of the technology. SECARB Early Test was recognized by DOE for furthering CCS technology and meeting G-8 goals for deployment of 20 similar projects by 2020. The Early Test is the fifth project worldwide to reach the CO2 injection volume of one million tonnes and the first in the U.S. Phase III of the regional partnerships was an excellent program that will achieve significant results for carbon capture and sequestration both in the United States, Canada and internationally… the individual projects within Phase III will complement each other and together build a comprehensive and expansive research program, the size and scope of which is unique throughout the world.